(photograph courtesy of Stephanie Rekas. High Sierra Desert or Meadow? This is I suppose it wouldn't be right to talk about the pristine beauty of the High Sierra without also talking about one of its problem areas. Sierra meadows come in many forms. We're all familiar with the low "golf course like" alpine meadow grass which is a prolific as the ground squirrel or marmot. Then there are the high grasses of the Sierra out of Bridgeport at Upper Paiute Meadows. The meadow grass is so deep that you can barely find your stock once you've turned them loose to graze. I distinctly remember a Sierra Club Family High Trip here in 1966. What a trip that was! We went up Buckeye Creek, through The Roughs, and down Kirkwood Creek to Upper Paiute Meadows where we made camp amid "the Tall Grass." From Paiute Meadows we made our way over Dorothy Lake Pass, and down Falls Creek to a spectacular camp and electrical storm on Tilden Lake. This summer Melvin Joseph was packing a string of bronc bay mules, Bonny, Clyde and three others whose names I can't remember. Melvin was either tying up or untying one of those mules to his picket line when it reared up and jumped on him with his front two feet flattening him on the spot. Melvin didn't take this lying down, even though he was at the time! He immediately jumped up and beat the living tar out of that mule. When Melvin got finished with him, it was the mule that was shaking with fear, broken, and not Melvin. It was all in days work for Melvin who often teamed roped with Tommy Jefferson in the rodeos. Back to the meadows: let's see where were we, ah yes, alpine, grass and also there is the "low-shrub" meadow as I like to call it which is filled with short grass and sage such as Tunnel Meadow in the picture to the upper left. 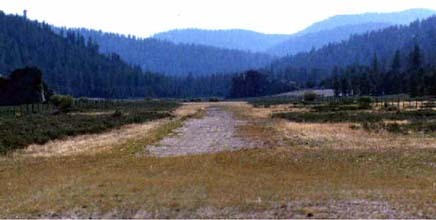 Tunnel Meadow is where Bob White's Flying Service, operating out of Lone Pine Pine for many years, ferried campers and hunters in and out of the High Sierra. Lastly, there is the meadow that I really wonder if it can be called a meadow at all. 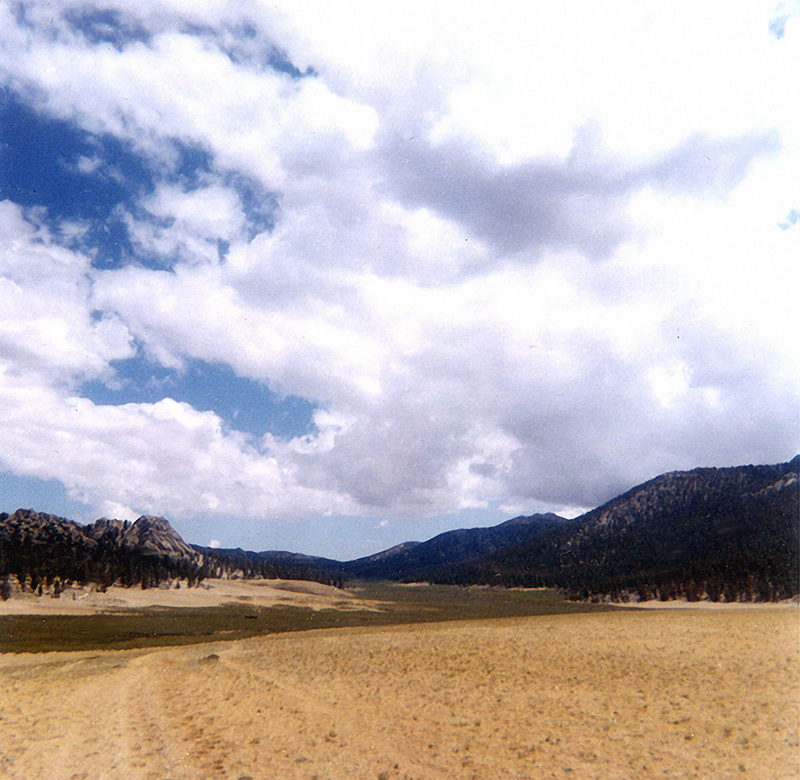 This is the big sandy expanse of a meadow that is prolific in the southern Sierra. Meadows such as Mulkey Meadow pictured below, Monache Meadows, Strawberry Meadows, Templeton Meadows, or large portions of Horseshoe Meadows and Ramshaw Meadows offer the packer and the backpacker little but glaring sun and seemingly endless dust. I ate my fare share of dust on many occasion packing through Mulkey Meadows on the way over Mulkey Pass to Horseshoe Meadows and the roadend at Cottonwood Creek. Sadly these "meadows" were not always sand and dust but were either the grassy type found at Tunnel Meadows or the high alpine type. Unfortunately these meadows suffered the fate of overgrazing by sheep and cattle during the summer months in the early part of the 20th century. It can be argued as to who did the worst damage. We all know that cattle eat the grass short, but sheep eat what's left and the root as well. It was because of the damage that the sheep did that there arose a regular "High Sierra Range War" in the early part of the 20th century between the cattlemen and the sheep herders. 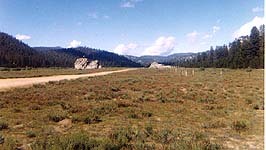 The cattlemen eventually won the war but the damage was forever done to the High Sierra Meadows. They probably will not recover until the Master comes in glory in the clouds restoring those things which we have been neglectful caretakers of. From the archives of Bobby Douglas, images of Tunnel Meadows circa 1928. Many thanks to Bobby Douglas for sharing these photos of his grandparents and Mom. 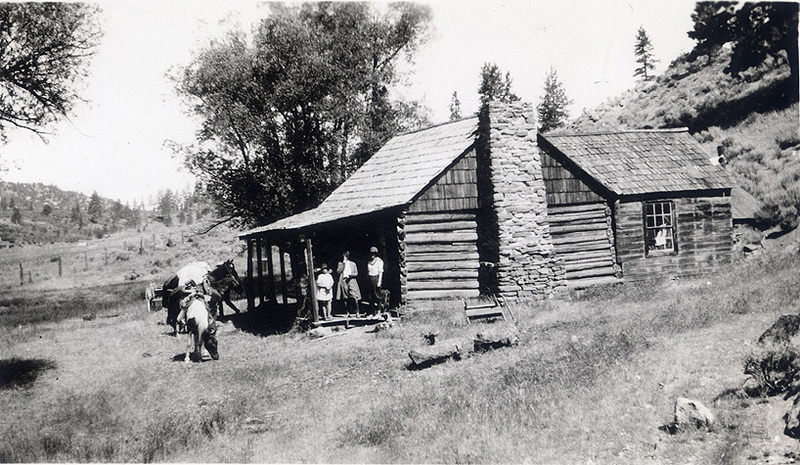 The Biering's home in Tunnel Meadow circa 1928 while they were taking care of cattle. Afred Biering in Tunnel Meadow area. Alfreda Biering, with her faithful companions next to her, and Afred Biering in Tunnel Meadow. Bobby's mother, Alfreda, was approximately 8 years old at the time of this photo. Tunnel Airfield was created by my uncle, Leonard Shellenbarger, at the request of a Dr. Shook in 1931. Dr. 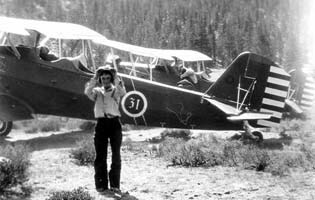 Shook was a friend of Bert Johnson, a cattleman, who wanted the airfield constructed so he could fly in and go fishing at the nearby Cottonwood Lakes. Leonard drug the airfield with a Fresno scraper pulled by a mule and was paid $40 by Dr. Shook for the job. The Fresno scraper was packed in on a mule [most likely by Mt. Whitney Pack Trains under the direction of Chrysler and Cook]. In 1931, "Hap" and a buddy flew in to Tunnel from March Air Force Base to do some fishing. When they were ready to leave in the afternoon, Leonard said that they could not make it out. Arnold's plane crashed and my son has a cigar-sized box that was made from scraps of the plane. My grandfather, Everett Shellenbarger, was the ranger there at the time. The earliest aeronautical chart depicting Tunnel Meadows Airport was on the August 1945 Mt. Whitney World Aeronautical Chart. 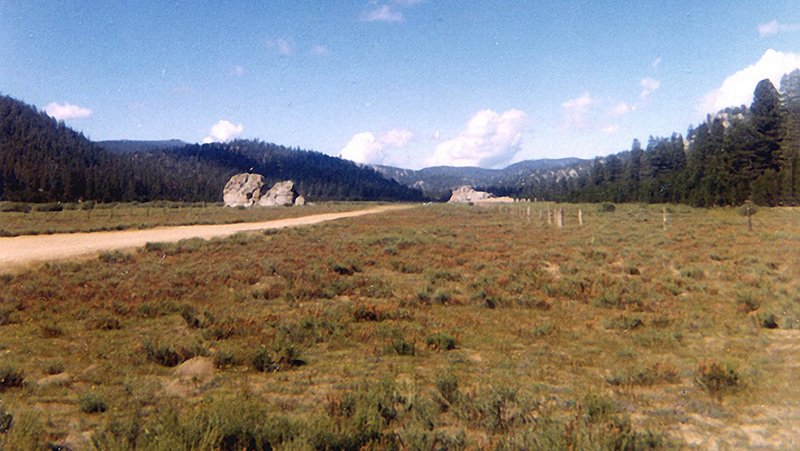 It depicted Tunnel Meadows as an auxiliary airfield, at an elevation of 9,100'. Ted Sarbin, who flew into Tunnel with his Cessna 180, recalled that the airfield was approximately 1,800 feet long. I flew into Tunnel twice with Bob White's flying service. I flew into Lone Pine but did not have the skill or a suitable plane to attempt a landing into Tunnel Meadows. There have been a number of accidents at the airfield. There was a single-wire (the other half of the circuit was ground) party line Forest Service magneto-crank phone located at the Air Camp. Cranking long-short-short would get Bob White to answer in Lone Pine and fly in to pick us up. If one were landing to the west, a go around was possible. Approaching in the other direction was marginal. When the Air Camp was in operation, Bob White had guides, pack horses for rent, tables and refrigerators which were used as ice boxes, since there was no electricity at the camp. 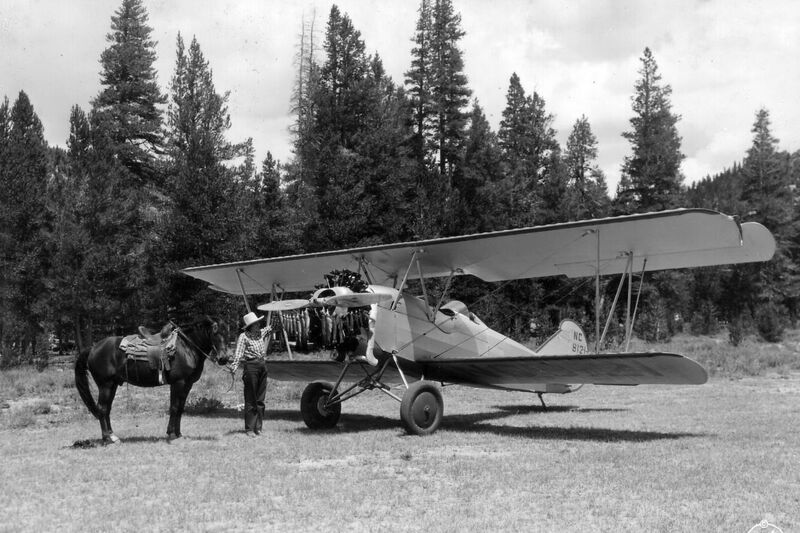 There was also a tractor for moving planes and taking the passenger's gear to their campsite. 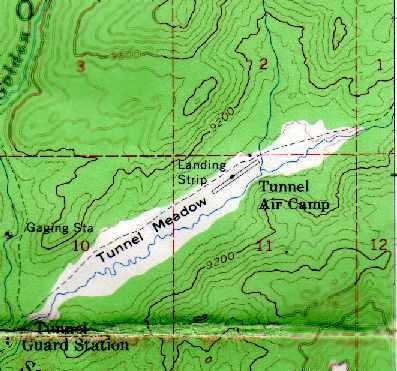 According to Ted, Tunnel Air Camp was closed when Tunnel Meadow and the surrounding areas were declared a Wilderness Area. 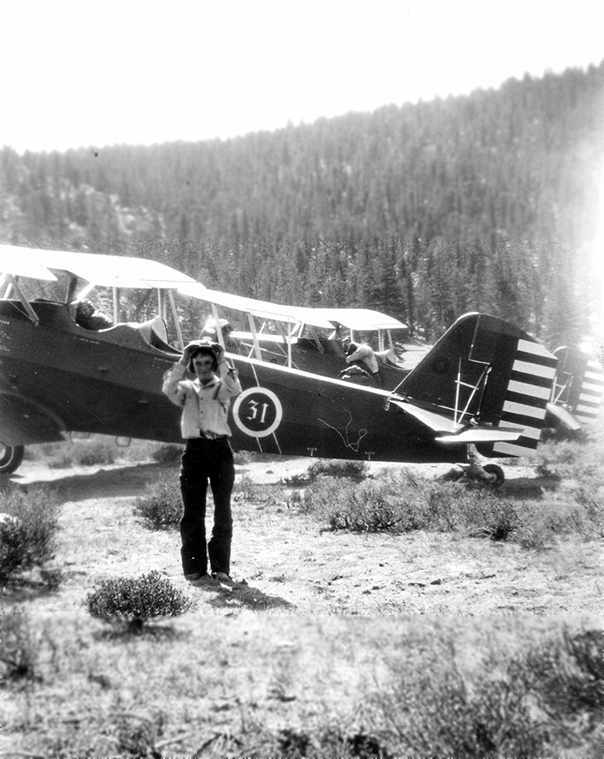 1931 photo of Pat Decano in front of two Army Air Corps biplanes at Tunnel Air Camp. 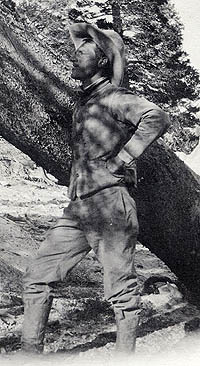 The biplanes brought Col. "Hap" Arnold from March Field to Tunnel Meadows. 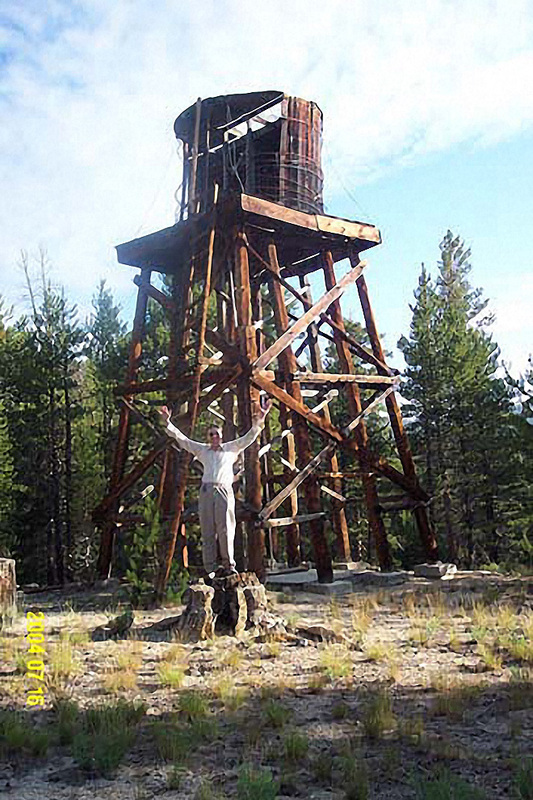 A friend who has been a geologist in the Southern Sierra and White Mountains just reminded me of your site and sent me the link. Thank you for bringing back so many memories that are dear to me. I was one of the 2 rangers at Tunnel in 1967 and 1968, and worked the front country in 1970. Oh my, what a time that was for me. I left a small note in your guest book. I promise to put together some stories and pictures and as a few questions where memory, which was never top notch, has failed. Meanwhile, here's a photo from 1968 of a guy I only remember as Salty, in his cabin I think on the west side of Templeton Meadow. 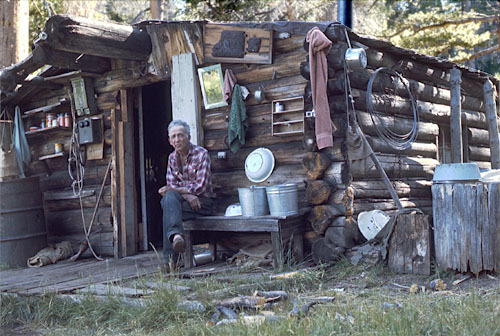 Salty at his cabin in Templeton Meadow. I was flying into Tunnel with my dad in the early 1960's. My dad and I would fly to Lone Pine and Bob White would fly us in. I've flown my entire life but I never was in a airplane that was loaded with as much stuff as Bob would care into the meadow. I always loved the place so much I talked my wife into back packing out of tunnel for our honeymoon in 1975. It was the last time I got to go in, a few years after our trip I heard that Bob had returned from Tunnel laid down on the couch at the airport and passed away in his sleep. I remember that Bob only had one good hand, his left. He had tried to hand prop a airplane at Tunnel and had not gotten his hand out of the way. The accident had broken all the bones in his hand, but had not broken the skin. He had the doctors form his hand into a position that let him "grip" the control yoke and also he had two fingers spread apart so he could operate the throttle He was a great guy. Last week my wife back packed into Tunnel for our wedding anniversary and was happy to find that we could still tell where the runway and camp were. Its great to go back to a place and find its still as beautiful as I remember it. My name is Nadine White Sigman. 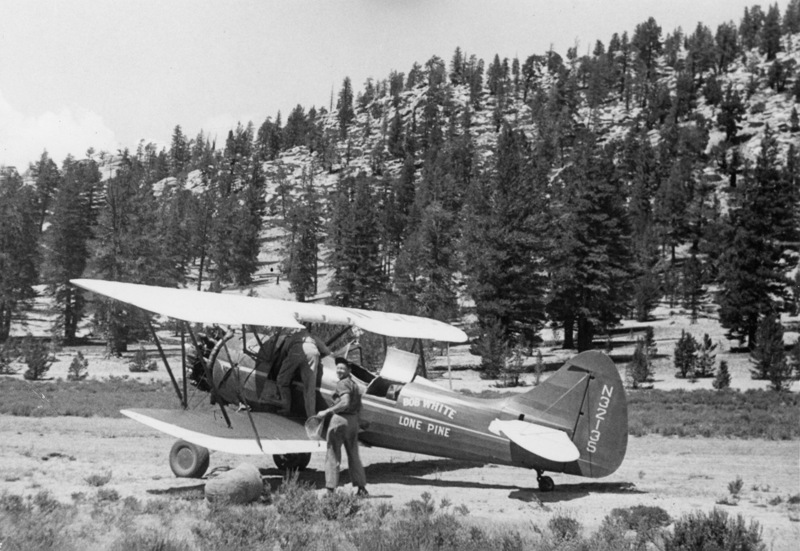 My dad was Bob White from Lone Pine Airport and Tunnel Meadows. These are very happy memories. The list of all the original packers and their sons and daughters. Lepy Diaz cowboyed for my dad, Bob White, in Tunnel Meadows in the '40s and '50s in the summer. In the winter, he worked at the airport in Lone Pine. Lepy was, I am not sure if he was, the first driver of the Twenty Mule Team ,or one of the first ones. I remember so many of the names of the packers list. When I was very young my dad would take me to Cottonwood to spend a few days with Bruce and Grace Morgan and play with their children. I have this beautiful oil painting that one of the Morgan girls painted and gave to my dad. It's of Tunnel Meadows looking down from the Ranger Station. I noticed you mentioned one of the guys in Anchorage. I was there in the late '40s and '50s. I was back and forth between my mom in Alaska and my dad in Tunnel and Lone Pine. In my senior year of high school I went to Lone Pine. The principal, Bill Bowers, was the principal in the winter and worked for my dad in the mountains in the summer. My English teacher, Mrs. Wright, taught in the winter and worked in Tunnel at the camp in the summer. When my dad passed away so many of the people on your packer's list came to the funeral. There was horse trailers, hay trucks, everything you could imagine parked at the funeral home. Thank you for what you are doing. I means a lot to me and to everyone else who remembers the old around-the-camp-fire days. That was when all the old stories that we remember today were told. I was searching for information about Tunnel Meadows when I ran across your posts and saw that you had flow in with Bob White. 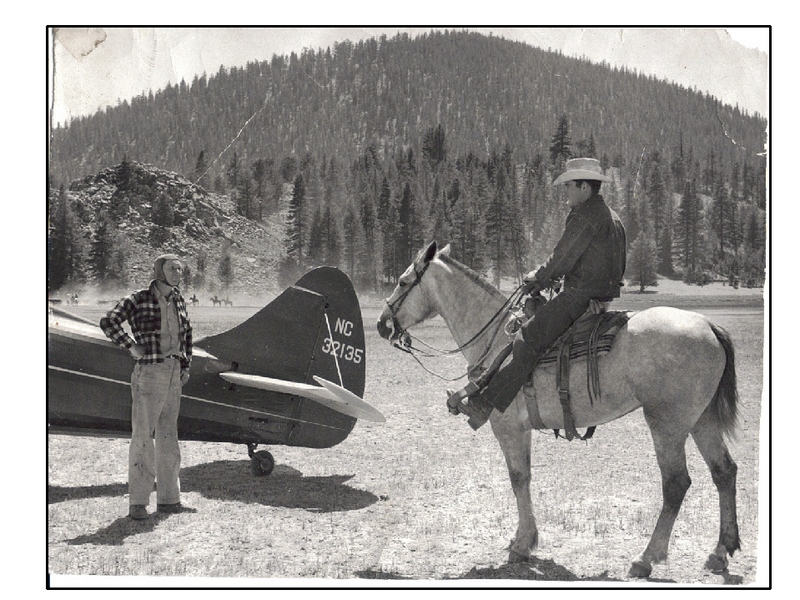 In about 1964 (I was 16) my dad, a neighbor and his son (the neighbor was a United Airlines captain) flew into Tunnel Meadows with Bob (it was the first time I had ever been in an airplane) and backpacked from there to a few high elevation lakes to fish for Golden Trout. At one of the lakes we found the shell of a USMC helicopter on the bank. When we returned to TM for Bob to fly us out we asked about the helicopter and he informed us a couple of USAF officers had flow in to fish and crashed into the lake oh take off. Twenty-two years later my dad called me one day and told me to go to the book store and read the chapter titled "Operation Golden Trout" in Chuck Yeager's autobiography. Sure enough, Chuck and a USAF general had been drinking in the officer's club at Edwards AF base and after getting pretty smashed decided to go on a fishing trip for a few days. They got dropped off with all their camping and fishing equipment at the lake where we found the helicopter, but when the pilot returned to pick them up a few days later the altitude along with four passengers instead of two, plus all the equipment, was more weight than the chopper could lift. It crashed into the lake but Chuck, the general, pilot and co-pilot got out before it sunk. They hiked out and the general sent a recovery team back to salvage what they could - rank has it's privileges. After 22 years the mystery had been solved. My dad's name is Emil Hesse. As a boy I flew to Tunnel Meadows many times with my dad and mother. My dad owned a flight service out of Corona, CA called Corona Air Service and we used to fly to Lone Pine where my dad would visit with his old friend Bob White who flew charters in to Tunnel Meadows. We flew either our Cessna 180 or 185 when going to Tunnel. I caught many a golden trout there as a boy. My dad passed back in 1984. I remember my dad telling me that he signed off Bob White's paperwork for his commercial flight rating. My dad had been an advanced aerobatics instructor in WWII teaching Navy & Army Air Corp pilots. At the time we had two daughters, ages two and one. We would be going to the 10,000-foot-elevation Kern Plateau, just south of Mt. Whitney. 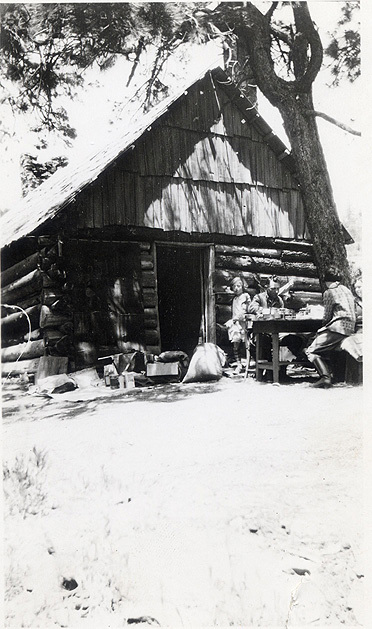 The nearest town, and for that matter, the nearest road, was 30 miles away, and we would be stationed there from early June to October in a cabin with no electricity. “Are you sure?” I asked, even knowing that Theresa was every bit as adventurous as I was. “Yep,” she said, “it sounds like fun.” She proved that summer what I already knew: that she was a trouper. Thanks for the wonderful tour of this unique part of history in the Sierras. I had the good fortune to visit Bob White's flying camp as a youngster. In about 1965, when I was 16, Bob flew my dad and three boys into the Tunnel Meadows Camp for some fishing, riding, hiking, and growing up. Bob's championship flying skill was the great beginning. He gently side-slipped that big Cessna Stationair down the steep, curving approach to a perfect touchdown on the short narrow high-altitude dirt airstrip. The approach was not only crowded with mountains and trees, but also sprinkled with the wrecked airplanes of those who didn't get it right one time. In a very short time at the camp, I fell in love forever with the wind in the trees, the cold, clear running stream beside the camp, and the still silence of the nights. Leaving the camp after two weeks was the hardest goodbye I ever said. My wise old dad must have known that, because somehow he talked Bob White into "hiring" me the next summer to actually work at the camp with wrangler Bud Loniker, cook and tough-guy Shorty, and Bud's little dog he called "Peachy" who herded the stock better than anybody. I didn't get money, but I got time off, a horse to ride out on, and all the food I could eat. It was everything I needed. My main daily job was to get the stock into the corral every morning, brush them down, feedbag them, and get them saddled up for the guests' trips. I still can see the horses - Jimmy (only Bud could ride Jimmy), Bob, Roany, old Roy, and the pack mules Blackie (who bit) and Brownie (who didn't). I also helped Bud and Shorty with garbage detail, latrine digging, camp cleanup, etc. To this day, that summer is as clear, sweet, and wondrous as any memory I have. 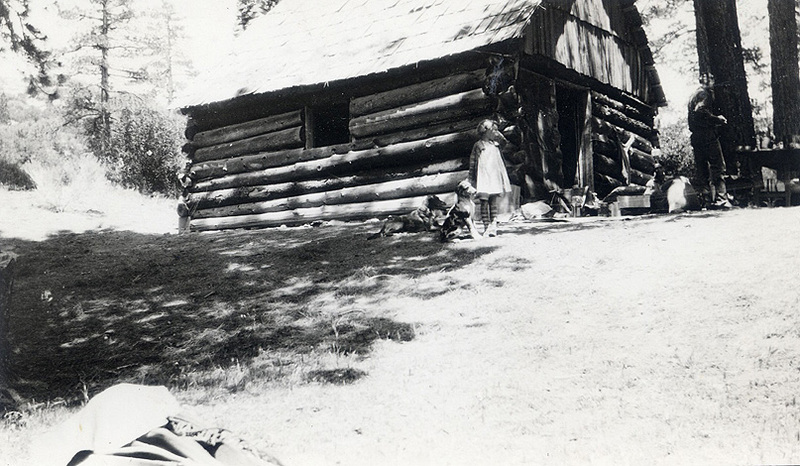 We mended fences, guided the guests to lakes and fishing streams, cared for the stock, caught dinner in the local creeks, fried up those little Golden Trout that Shorty called "popcorn." It was a big change for a city boy to rise before the sun and go to sleep with nightfall each day. Those rhythms still feel like the natural and right way to me. It makes a man, even just a boy, realize the blessings that surround us constantly. And then when you get a few moments alone in the forest, you realize you are never alone at all. Thanks for your wonderful photographs and stories which bring all this memory rushing back to me. It's an honor to be acquainted with the White family of pioneers. I have so many memories of Tunnel Meadows. My dad and Bob White were good friends, both being WW II instructors. My dad flew for Bob when he was grounded with medical problems. 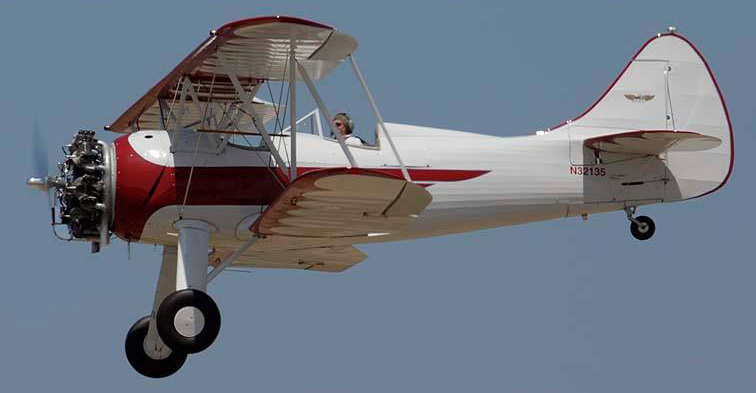 My dad bought Bob's 1964 180 - N4792U - and used it to fly into Tunnel, Monache and Templeton Meadows. Each summer we would shuttle in our gear and set up tents on pads that remained year after year. We were there the year a Staggerwing ran off the end of the runway. 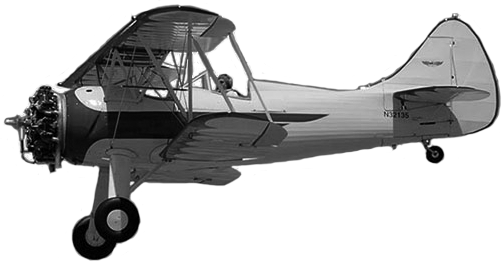 As I recall, Bob's mechanic, Red, bought it and eventually repaired it enough to fly it out. We also witnessed a C 320 land and had to stay for several days until there was enough wind for him to take off. I never saw Bob as mad at anyone as he was at the 320 pilot. The fellow was a good stick but had no idea what he was up against at Tunnel. Bob taught all of us a lot about back country flying. I still think of him every time I make a tail low wheel landing in my 180. 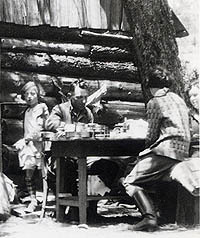 When I was running the pack station in Tunnel Meadows a family flew in for a week's stay. There was a man, wife and their two boys. The older boy was fourteen years old and confined to a wheel chair. Early in the morning the family would push the boy down to the river in his wheel chair. He would catch enough golden trout for breakfast. After breakfast they would pack a lunch and take off, leaving the older boy with me in camp. He would sit in his wheel chair and practice casting. He could sure handle a fly rod, sitting in a wheel chair he could lay a dry fly on a fifty cent piece sixty feet away. When he tired of this he was right on my heels. Where are you going? What are you doing? Why are you doing it? Try shoeing a horse with a kid in a wheel chair underneath the horse. One day I asked him if he would be afraid to get on a horse. He told me wasn't afraid anything. We had a old horse named Billy who was as gently as a kitten. I put a pack saddle of him, got a plastic milk carton, put some straps on it and hung it on the pack saddle and padded it up with an old blanket. I put a pack box on the off side, put some big rocks in it for balance and lifted the kid onto the horse. Rigged up a seat belt and asked him how he felt. I didn't have to ask he was wearing a smile you could see a mile. I led him around camp for awhile and asked him if he wanted to go fishing. You know the answer. I saddled my horse, handed him his fly rod and leading Billy we headed up the river. 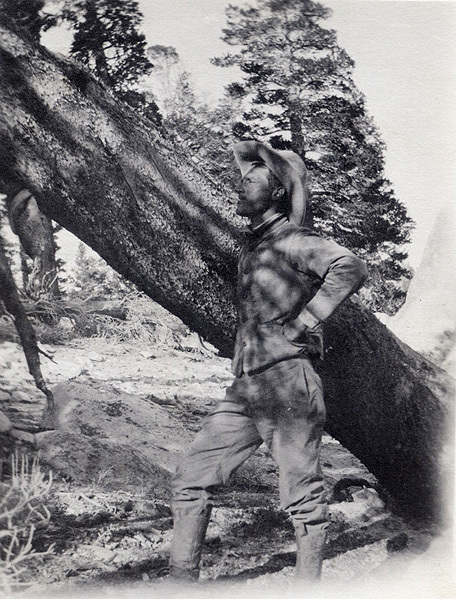 This was before they decided to remove the beaver from the high country and the beaver ponds were full of golden trout. The kid was catching and releasing golden trout as fast as he could get them off the hook and back into the water. Everything was going fine until his parents came around the bend. You can imagine how startled they were to see their son up on a horse. Until they called to him and heard his laughter, he was having the time of his life. For the rest of the week first thing in the morning I would saddle up Old Billy and the whole family took their picnic lunch and headed out to enjoy the beautiful golden trout wilderness. I don't remember the family's name; but, a few weeks later I received a beautiful thank you card and beautiful Fenwick fly rod, with Duane, Sierra Packer embossed on the side.